If you’ve ever had a chance to visit the The American Museum of Natural History in New York you’ll not only be enthralled by all the amazing exhibits but you’ll quickly find out there’s a lot more to do. When visiting you can head there and catch an IMAX adventure. Starting now through Mid September The American Museum of Natural History in New York will be debuting a new IMAX documentary called Amazon Adventure starting March 9th through mid-September. Amazon Adventure traces the extraordinary journey of 19th-century naturalist and explorer Henry Walter Bates. As a young man, Bates risked his life for science during his 11-year expedition into the Amazon rain forest. The film is a compelling detective story of peril, perseverance, and, ultimately, success, drawing audiences into his fascinating study of animal mimicry, the phenomenon in which one animal adopts the look of another. 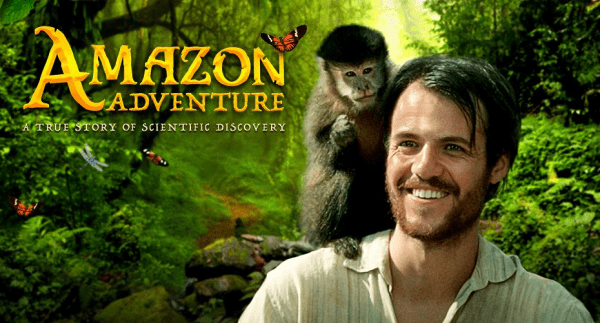 Developed and produced by SK Films in close collaboration with HHMI Tangled Bank Studios, Amazon Adventure also received major funding from the National Science Foundation through the film’s educational outreach partner, Pacific Science Center. Other key partners include the Gordon and Betty Moore Foundation, the Simons Foundation, and Foxconn Brazil and Vale. So if you’re in the New York City area from now until September 13th make sure and check out this amazing adventure! For more information or to buy tickets head over here. This would be nice to see.